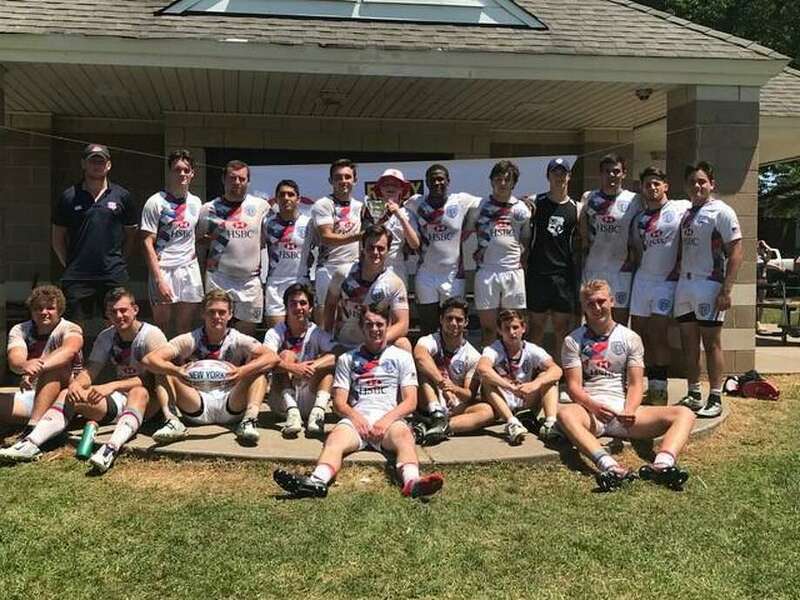 The Connecticut high school all-star rugby team went 4-0 in the USA Rugby Northeast Regional Cup Tournament recently and was selected as the No. 1-ranked all-star team in the nation. The Connecticut high school all-star rugby team proved it was the best of the best at the USA Rugby Northeast Regional Cup recently in Rahway, N.J.
Connecticut’s all-star squad rolled past each one of its four opponents, posting two shutouts along the way. Northwest, midwest, south and west Regional Cup tournaments were also held and following the competitions, the Connecticut all-star team was ranked as the No. 1 squad in the country. Greenwich High School coach Joe Kelly selected the players for the Connecticut all-star team, which was coached in the Northeast Regional Cup by his son, Joe Kelly Jr., who serves as one of the assistant coaches of Greenwich High’s team. Connecticut defeated a team from Washington, D.C., 26-0, Rugby Pennsylvania All-Stars., 52-12, New York, 43-12, and New Jersey, 40-0. The Connecticut halfback combination of Lorenzo Villani and Sebastiano Villani were difficult for the opposition to contend with, while teammates Ben Van Der Merwe and Jacob Robb also excelled. Connecticut also received key performances from prop/flanker Ray Weiner and high school All-American selection Charlie Overton. Twelve players on the state’s all-star squad were from Greenwich, which qualified for the national tournament and won its 11th consecutive state championship this spring. Six all-stars were chosen from Staples, which played Greenwich in the state title game. Five all-stars hailed from Aspetuck Valley Rugby Club and Fairfield Rugby Club was represented by one player on the all-star team. Connecticut’s 24-player all-star rugby team included: Eddie Schmidt (Greenwich), Sebastiano Villani (Greenwich), Ben Van Der Merwe (Staples), Finbar Doyle (Greenwich), Nick Mcintosh (Greenwich), Andrew Nanai (Greenwich), DJ Brown (Greenwich), Lorenzo Villani (Greenwich), Robby Barter (Greenwich), CJ Coyle (Greenwich), Aengus Rosato (Greenwich), Charlie Overton (Staples, high school All-American), Paul Koullas (Greenwich), Louis Gryspeerdt (Staples), Ray Weiner (Aspetuck, high school All-American), George Harrington (Staples), Owen Skinner (Staples), Ethan Beri (Fairfield), Jacob Robb (Aspetuck), Ben Klau (Staples), Mate Kvirikashvili (Aspetuck), Rob Servgiyenko (Aspetuck), Joshua Lisi (Aspetuck) and Evan Weigold (Greenwich). Connecticut was voted as the top-ranked team, among 40 all-star squads in the nation.